Microsoft has announced a raft of new hardware accessories that are designed to accompany Windows 8, and there's an update for the Touch mouse on the cards as well. 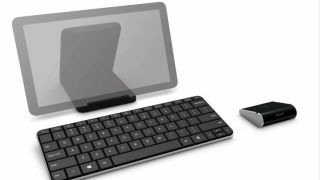 The Wedge Touch mouse and Wedge Mobile Keyboard join the Sculpt Touch Mouse and Sculpt Mobile Keyboard are all designed to play nicely with Microsoft's next-generation OS. "Our new mice and keyboards really light up Windows, providing fast and fluid navigation, increased productivity, and enhanced mobility packaged in sleek, stylish designs," said Brett Kelleran, general manager, Microsoft Hardware. "Microsoft Hardware is designed by Microsoft, optimised for Windows." The Wedge range includes a mouse that's 'small enough to fit in your pocket' which obviously would apply to most of its peers but we're assuming means that it's designed to be portable. It packs Microsoft's underrated BlueTrack tech, offers four-way scrolling and Bluetooth and is priced at $69.95 with no UK price announced as yet. The Wedge Mobile Keyboard is designed specifically for Windows 8 tablets and "brings full-size keyboard comfort, efficiency and speed to a tablet" according to Microsoft. The Sculpt range is a cheaper shaped range also designed for portability and includes a $49.95 mouse and a similarly priced keyboard. Last, but not least, Microsoft will be updating its original Touch Mouse with gesture settings for Windows 8. The $80 mouse will now allow three finger zoom gestures: two finger app management and thumb gestures, all of which we enacted on our commute in the car this morning.